Here’s one line from that story that says it all, with tongue-in-cheek homage to the “three kinds of lies” epigram: “In the first 10 days of April, Windows 7’s average daily share was 32.2% as measured by StatCounter, besting XP’s average of 30.7%.” Later on in the same story ComputerWorld fesses up to relate: “Data from rival metrics vendor Net Applications paints a less-impressive [Ed remark: and more consistent with NetMarketShare.com] pciture for Windows 7. 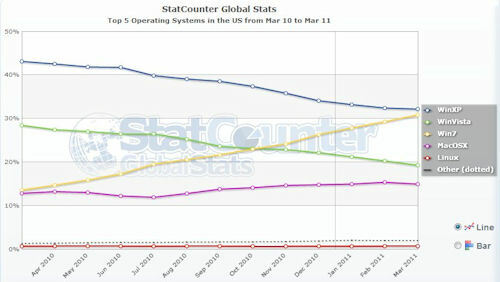 Net Application’s March numbers put Windows 7’s global usage share at 24.2%, compared to XP’s 54.4%. 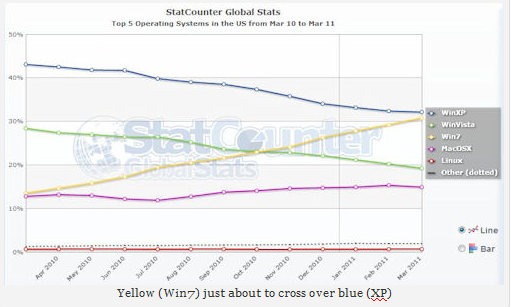 But this contrasting graph from StatCounter, which clearly shows the crossover point between Windows XP and Windows 7 in the US occurring in early April (dark blue and light yellow lines), does give some credence to StatCounter’s reporting. But without independent and reliable confirmation, I can only treat this report as suggestive, rather than conclusive. Even so, Microsoft should be taking great cheer from these numbers, while also hoping that the Chinese legions get on the upgrade bus before the end-of-life date for XP in 2014.